Crusaders boss Stephen Baxter is looking forward to the "huge" north Belfast derby on Boxing Day as the leaders face title rivals Cliftonville. The champions have opened up an eight-point gap on the Reds ahead of the festive clash at Seaview. "It's a massive game - it always had that sense of occasion with a full house expected," said Baxter. "Nothing will be decided from this game but we face a top, top team with good players and they're doing really well." 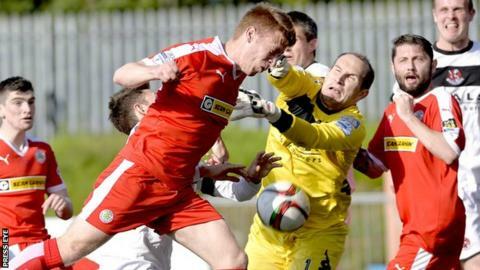 Cliftonville slipped back in the title race following a 2-0 defeat by Glentoran last Saturday. Reds manager Gerard Lyttle wants his team to respond with a derby victory but he realises the size of the challenge. Join presenter Michael McNamee for Irish Premiership action on a festive Saturday Sportsound from 14:00 GMT on BBC Radio Ulster. Joel Taggart and Liam Beckett are on commentary at Seaview as Crusaders meet Cliftonville. Michael Hammond and Philip Mitchell will take you through the action from Glentoran v Linfield. There will also be reports from the other four matches and the latest sporting news. "It's important we bounce back for the defeat and put things right," said Lyttle. "However, Crusaders are on a great run, winning every game so it will be a tough game." Linfield manager David Healy and Glentoran counterpart Alan Kernaghan will experience their first 'Big Two' showdown on Saturday. The Blues are unbeaten in four games although Healy said he was "a draw away from a crisis at Linfield". Kernaghan's team will be boosted by beating the Reds and they now face their traditional foes at the Oval. "There will be no need to get the players revved up - that will be the same with both teams," said the former Republic of Ireland player. "They all know what it means to the supporters and they will be going out to try and entertain them." Glenavon and Portadown meet at Mourneview Park with the Lurgan Blues 11 points ahead of their mid-Ulster derby rivals. Coleraine will aim to end a run of three straight league defeats when they host Ballymena United in another Boxing Day derby. Carrick Rangers will be without the suspended Conor McCloskey for the trip to bottom club Warrenpoint Town while Ballinamallard United take on Dungannon Swifts at Ferney Park.